Give the other managed data providers -- System.Data.OleDb, System.Data.Odbc and Microsoft.Data.SqlXml -- a test drive. Most data-centric VB 2005 demonstration projects connect to a SQL Server instance with SqlClient objects while developers gain familiarity with .NET's panoply of System.Data classes. Thus, the preceding examples use the SqlClient data provider. You should, however, give the other managed providers -- System.Data.OleDb, System.Data.Odbc, and Microsoft.Data.SqlXml -- a test drive with the OleDbDataProjects.sln project in your VB2005DBChapter01 OleDbDataProjects folder. Figure 1-4 shows OleDbDataProject's form with list boxes and a text box that display data generated by each of the three providers. 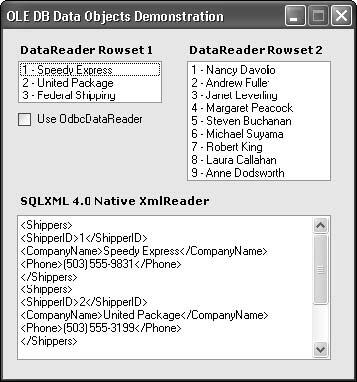 Marking the Use OdbcDataReader checkbox substitutes the Odbc for the OleDb data provider to fill the Rowset 1 (Shippers) list box. You can take advantage of ADO.NET 2.0's new DbProviderFactories.GetFactory ("System.Data.Provider") method and the DbProviderFactory.CreateConnection and CreateCommand methods to generate a connection to and commands for any available managed data provider. Chapter 2's "Use the DbProviderFactories to Create Database-Agnostic Projects" section shows you how to write applications that accommodate multiple relational database management systems. Each sample procedure has its own connection string. You must modify each connection string to point to your Microsoft Access, SQL Server or SQL Express instance. The SQLXML Managed Classes (Microsoft.Data.SqlXml) native data provider for SQL Server 2000 isn't a member of the .NET Framework 2.0. It's a component of Microsoft SQLXML 4.0, which VS 2005 and VB Express install as Microsoft.Data.SqlXml.dll.
' "Data Source=localhost;Initial Catalog=Northwind;Integrated Security=SSPI"
'strSQL += ";SELECT EmployeeID, FirstName, LastName FROM Employees"
cmdReader.CommandText = "SELECT EmployeeID, FirstName, LastName FROM Employees"
You must close the first DataReader before you change the CommandText property to reuse the OleDbCommand object.